A couple months ago, I shared one of my newest better-for-you swap finds – Brummel & Brown – as the secret ingredient to making an absolutely amazing Caprese Toast. Made with plant-based oils, purified water, and the goodness of real yogurt, it has a wonderfully creamy flavor with less fat and calories than butter. Since then, I’ve been using Brummel & Brown in just about in the kitchen…can’t stop, won’t stop! 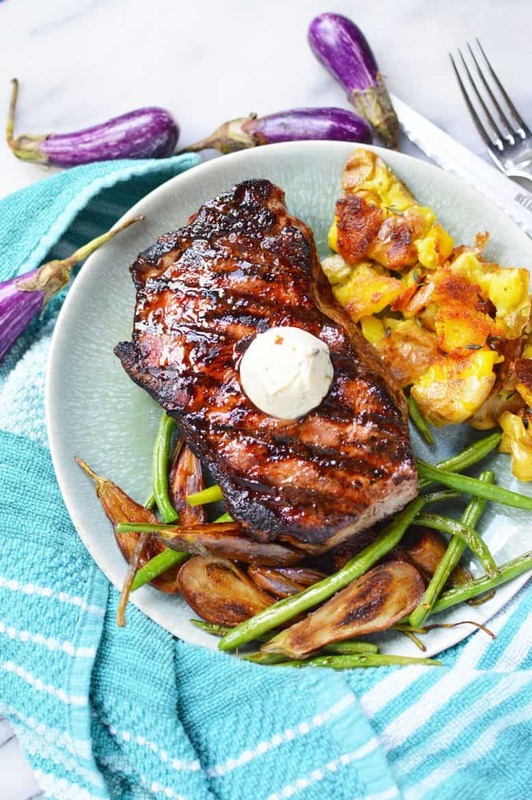 My latest favorite way to use it developed over our summer BBQ escapades, and I’m sharing it with you now because it transitions so easily into fall (or for those evenings when you just don’t want summer to end) – a Brummel & Brown Herb Compound that you’ll want to put on EVERYTHING. I mean it. Make a batch and keep a small amount ready to go in the fridge, while saving the rest in the freezer for when you run out. And believe me, you will. Feel free to switch out the herbs used here, like Thyme, with something you love – like Rosemary, Basil, Garlic or even …. honey. Yes, I said it. Honey. This no-brainer “recipe” is bound to have you creating your own Compound Concoctions that you soon won’t be able to live without either. But first, take a look at what I did below. Then feel free to run wild with it and let me know how it goes! 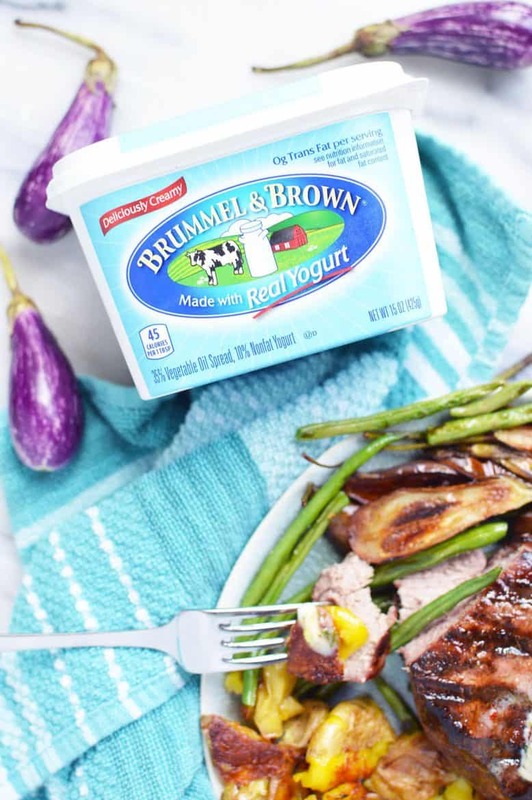 Combine the perfectly spreadable Brummel & Brown with the fresh thyme and Mediterranean seasonings. Either chill as is, place on parchment paper, wrap and roll into a log or fill a silicone mold tray with the spread, we opted for this last one. Allow the spread to chill until solid. 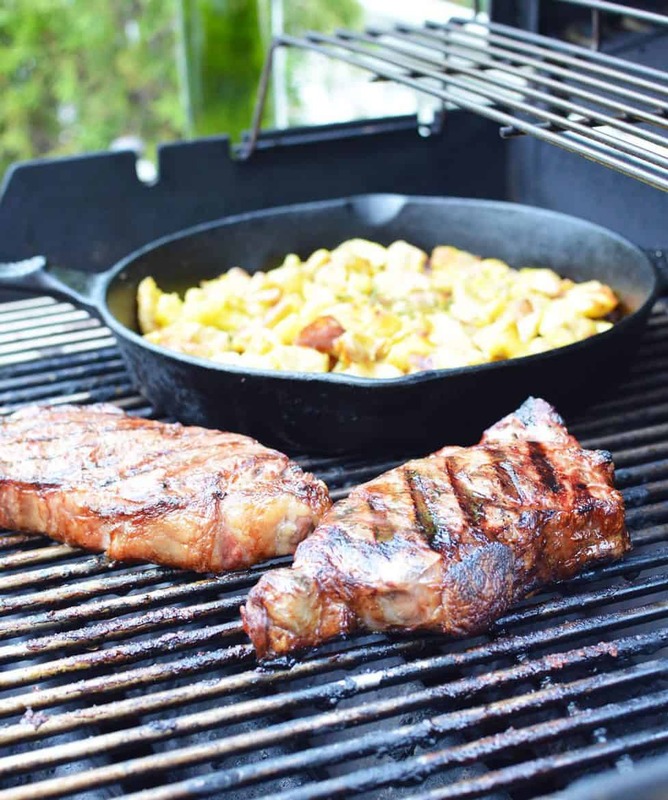 When ready to cook the steaks, heat your grill to medium high and cook the marinated steaks on each side for about 4-5 minutes. The steaks we cooked were really thick, this time will vary widely depending on the size, style and thickness of the steak you choose so keep a close eye to ensure it is prepared to your liking. When done, let the meat rest for a few minutes before plating. 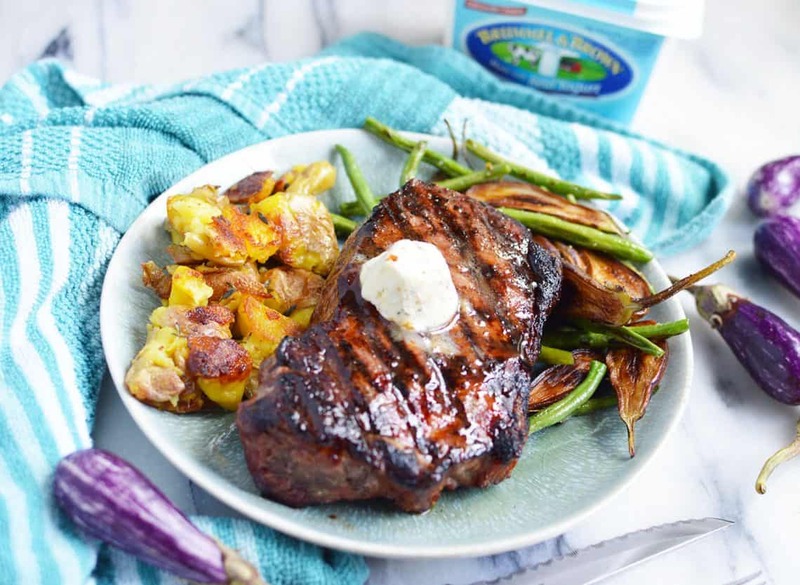 I set these lovely steaks up with the vegetables and a perfect gem of the herb compound that was loaded with flavor. We enjoyed these with smashed golden potatoes, tiny fairy tale eggplants and green beans, each sauteed in a bit of Brummel & Brown. TIP: I mixed this tasty compound up the day before we planned to grill so we would have perfectly portioned herb compounds set to individual servings. You can certainly make a roll of the compound and then slice off as you need it the same day. 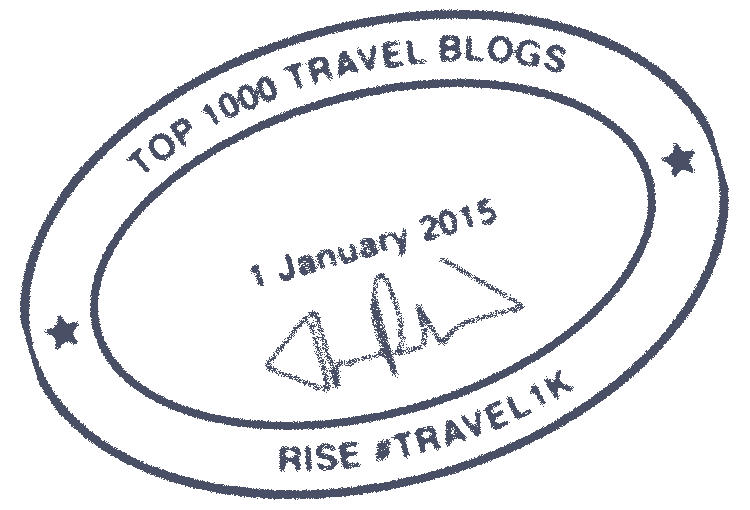 *We have kept the extra servings of the herb compound in the silicone tray in the freezer and they are keeping perfectly just waiting for their next use! You can find Brummel & Brown by the butter spreads at Albertsons. 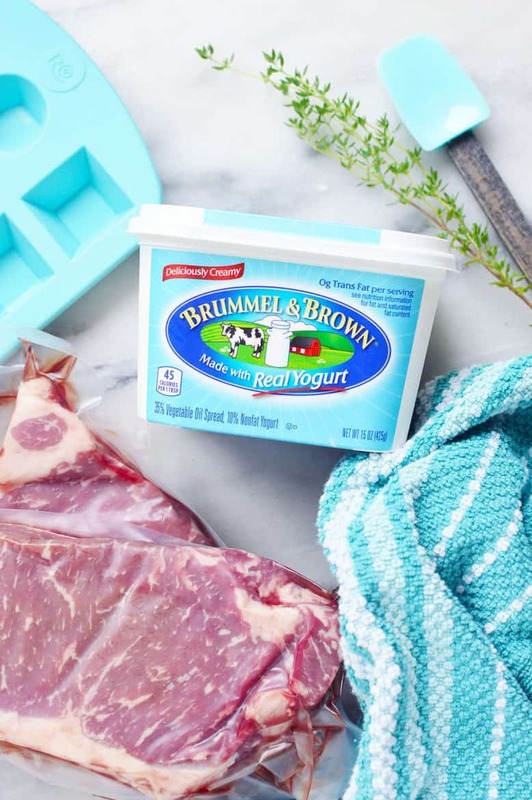 Use this Just 4 U Digital Coupon to SAVE $1.00 on any ONE (1) Brummel & Brown® spread product – Valid 9/4/18 – 10/13/18!